Hi Geo and all. Just wanted to say thanks again for the tips for my trip to Montreal. First, Porter is THE way to go to Canada IMO! Great service, free snacks and beverages, nice employees, great linge with wifi for connecting flights, etc. I did not turn on my phone really at allude to exorbitant roaming charges and don't think I got many food photos. That said, wow, we had some wonderful food and a great time. Schwartz's was wonderful; that smoked meat is sort of like a more flavorful corned beef cut thicker than we shave it here and I wish I had some to bring home! We hit Jean Talon market on Friday. I would weigh 400 pounds if I lived there because I'd be hitting the market every day. Every item of produce we tasted was PERFECT. Really. Bought some jambon and cheeses from the permanent stands (surprised there weren't more bakeries to be honest) but the bread we ended p with was great and we loved this meal. And the macarons. 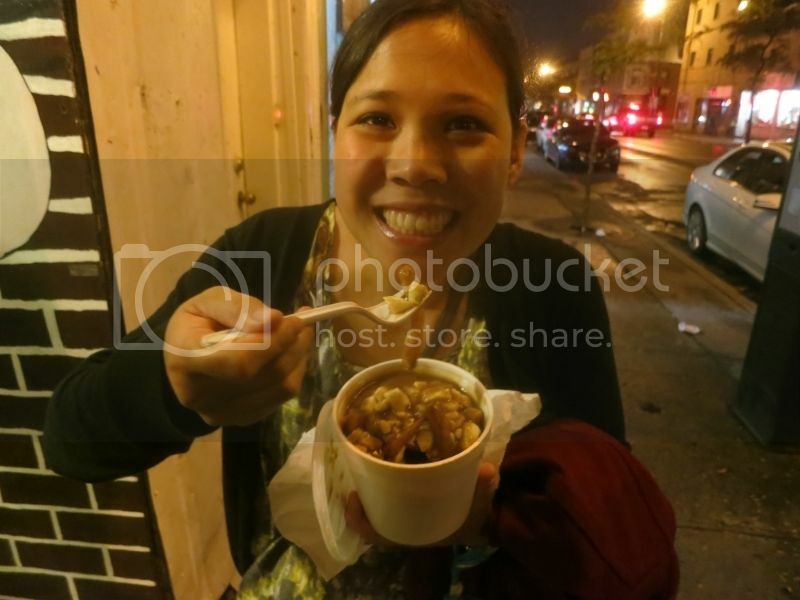 The Frite Alors stand is closed at the market so we ended p having dinner at La Banquise and I found their poutine to be good. Not as great as I'd expected, the fries not covered in gravy were sort of cold and not especially crunchy. And I don't quite get the cheese curds...they don't really melt into the potatoes or anything. Still, I could see getting a craving for this stuff. Yup. Waitress there suggested a patisserie along our route home, got some delicious cakes but we were stuffed and exhausted and I think ANYTHNG chocolate would have made us happy. We didnt feel like we had good enough directions to find Fairmount Bagels so ended up at St Viateur. Quite delicious if a bit surly service. We lunched in Old Montreal ata cafe that was right at the corner of Commune and St Jacques I believe, just needed to sit and drink some sangria and listen to the street musicians. Ham and cheese sandwich was surprisingly good. Do not know the name, will edit if I find my receipt. Went on a river cruise that was refreshing if not really the 60 minutes they advertised. We had been unable to get reservations at Au Pied du Cochon, Mechant Beouf had been suggested as an alternative and it was good. Loud. My daughter's burger was good, we had a charcuterie platter with a bit of foie added that was quite unctuous and delicious. Went to watch fireworks and then returned to MB for a strawberry shortcake dessert that was spectacular. Sunday Breakfast at Universel on Peel was our final meal together, food there was great and I'd surely recommend it. Had tried to work in the Food Truck festival on Saturday but just didnt have time. I'd go no back to Montreal in a heartbeat. Thanks to all who've posted here, I read copiously! 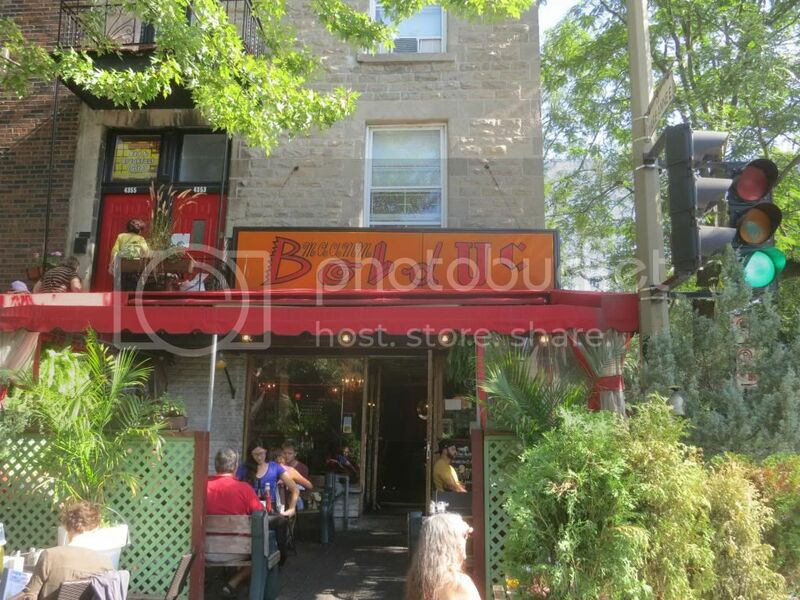 For those of you planning on a visit, we really enjoyed Le Comptoir: http://comptoircharcuteriesetvins.ca/ as well as Buvette Chez Simone. http://buvettechezsimone.com/ Nice wine lists, focused food menus, and friendly staff. Snap and I made it out to Montreal for a weekend recently. I was excited to visit Montreal for a variety of reasons, but none of my reasons could compare to my wife's passion for fries covered in cheese and gravy. She grew up eating at diners in New Jersey where the local specialty of french fries covered in mozzarella cheese and brown gravy was known as disco fries. She's loved gravy covered cheese fries since she was a teenager and a trip to Montreal for her was a pilgrimage to the culinary capital of the gravy-doused fry world. 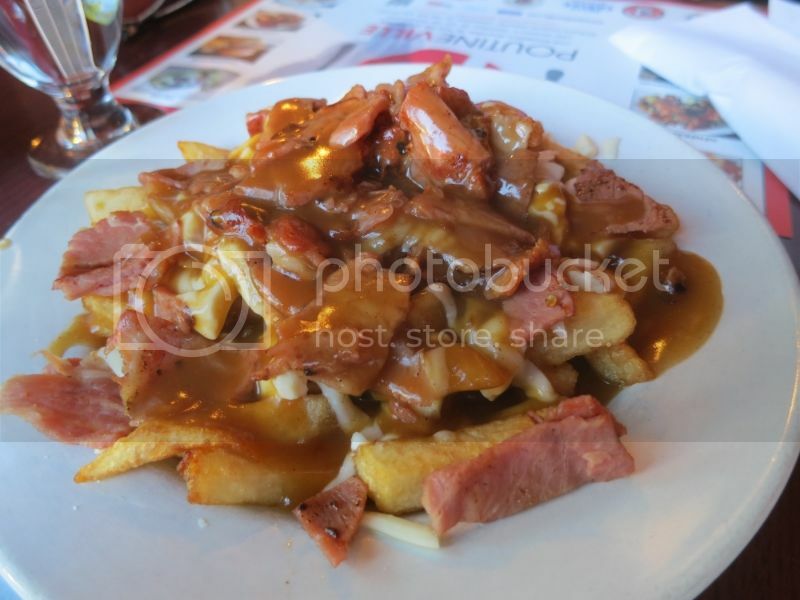 Poutine is probably the most famous rendition of this dish. It's available all over Montreal; as common as burgers and hot dogs in Chicago. 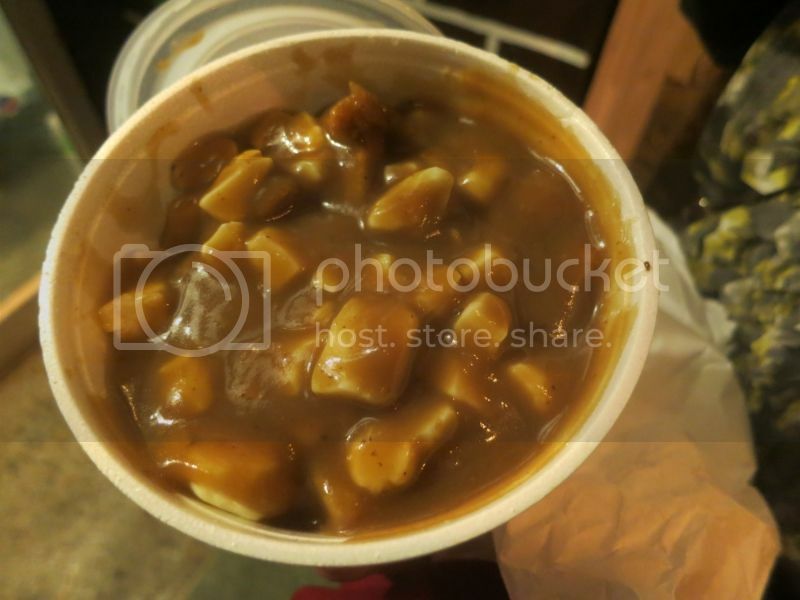 The classic poutine is simply french fries, cheese curds, and brown gravy. With the growing popularity in Chicago and beyond, poutine has been elevated and reinvented in countless ways, see: Poutine Fest. Though the classic poutine certainly isn't hard to find, the proliferation of poutine with unqiue toppings and different gravies was on display in Montreal in full force. Even relatively humble poutineries offer dozens of toppings and combinations. What I found most interesting was that shops specializing in something else felt compelled to offer a poutine featuring their signature ingredient. Schwartz's deli offers a poutine with their smoked meat, Rotisserie Ramados makes a poutine with their Portuguese chicken, and even Au Pied de Cochon tops their poutine with foie gras. We wanted to eat other things too (well maybe just me) so we limited ourselves to four different poutines on this two day trip but we easily could have eaten poutine the entire time and still enjoyed a wide range of flavors and quality ingredients. Montreal is a poutine loving town for sure. 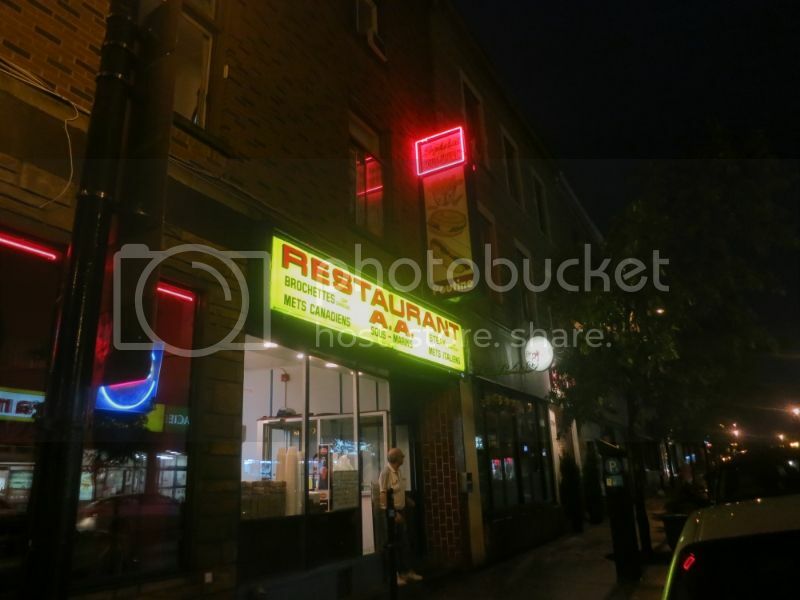 I did lots of research on where to get the best poutine in the city, and many of the same places showed up on list after list. But as it so frequently turns out, one of the best renditions we had was at the most unexpected of places. We had some time to kill before dinner, and none of the bars were calling out to us, so when we walked by a dingy looking diner with a picture of poutine on the sign, we decided we had to try it. There were a couple tables in the back filled with older men who were sipping on coffee and watching an old French spy movie. Most of the action was at the counter where there was someone almost completely dedicated to cutting potatoes and frying them to order. There was a stack of fries that had already been fried once that were put back into the fryer for crisping after we ordered. We ordered the petit, and good thing, because it was huge. We decided to take it to go so they piled our fries into a plastic container. The curds were pressed down on top, then the entire thing was smothered in gravy. The result was the epitome of simple food done well. The curds were nice and squeaky, the gravy was peppery and hearty, and the fries were crispy and potatoey. It was was everything poutine should be. My favorite poutine of the weekend was at the extremely popular La Banquise. It's open 24 hours a day and when we walked by one night the line was down the street. We stopped by for breakfast and the place was empty. Good timing. 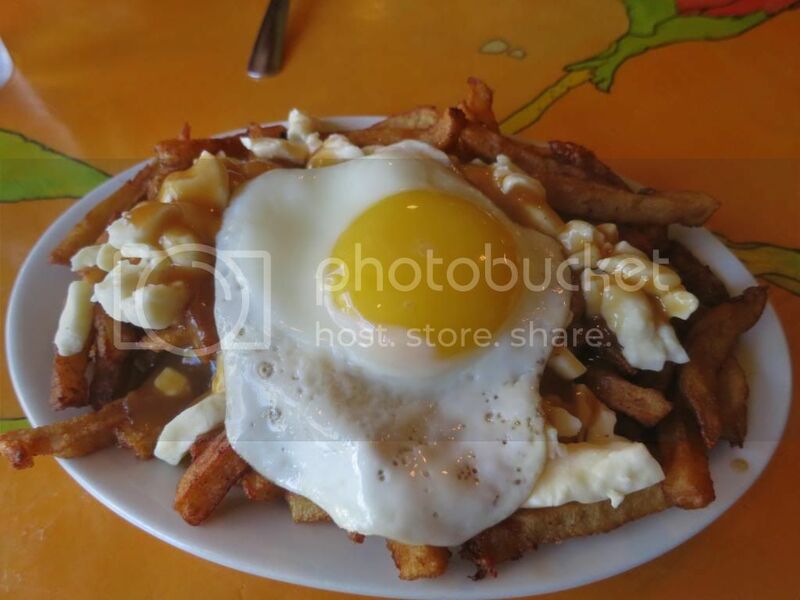 I had intended to order their classic poutine, but it was breakfast, and the fried egg on the table next to ours looked good, we asked for a fried egg on top. It was a nice addition and also didn't interfere with the base ingredients. 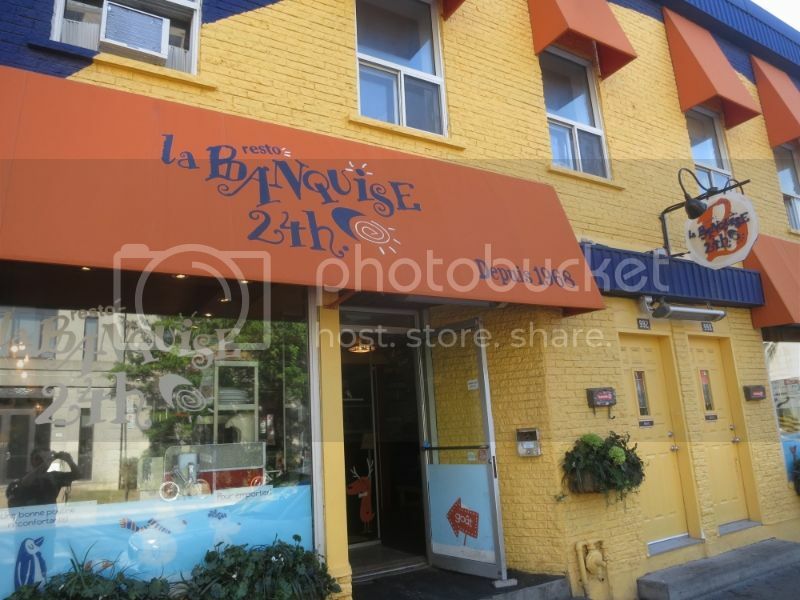 La Banquise truly has poutine down to a science. It succeeded on every level. The gravy had wonderful beefy flavor and was thick enough so it didn't make many of the fries soggy. The fries were crispy and brown, clearly double fried from fresh potatoes. The curds were squeaky and fresh. They have a wide array of over-the-top combinations on the menu, but I was perfectly happy with the classic (with an egg on top). 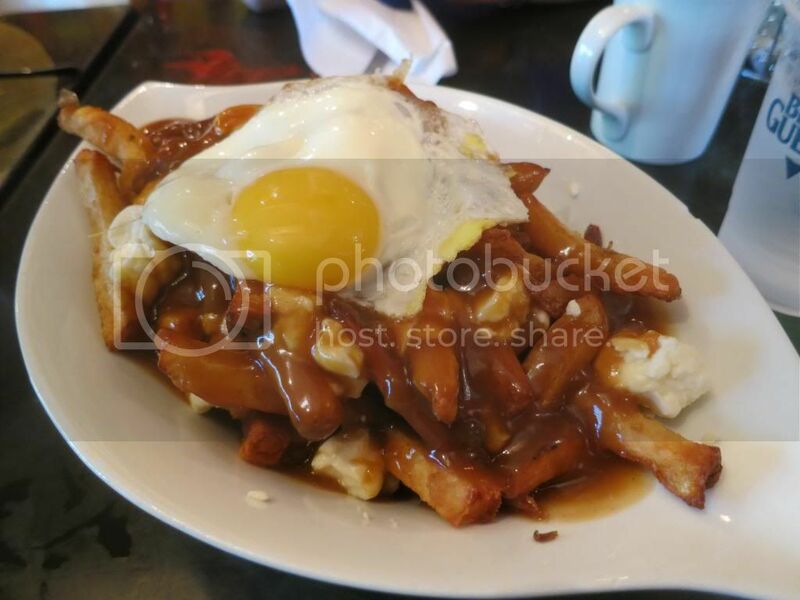 Maamm Bolduc shows up on many best-of lists of poutine and even the website claims theirs as the best in town, so I was surprised to see that it's really a brunch/lunch joint. The poutine is at the end of the menu and they only offer a couple different options. I didn't see poutine on any other tables, though granted this was early in the day. Once again we opted for a fried egg on top, and once again I have to say I was happy with the decision. There is a big pile of fresh cut potatoes in the back so clearly they're taking the poutine seriously. It was a good version but a step behind the other two. The fries weren't as crispy, the gravy had worcestershire sauce in it which I thought overpowered the other flavors, and the curds were more mild and not squeaky. Definitely still a good poutine, but not in the same league La Banquise. The last poutine of the weekend was my least favorite. 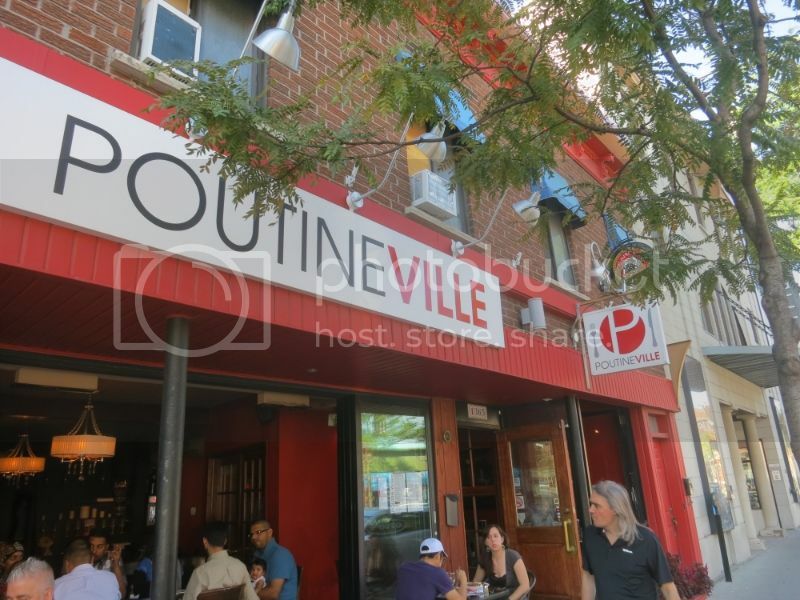 Poutineville shares many of the same accolades as La Banquise though it's much newer. They are famous for their make your own poutine option which you order from a menu like you'd see at a sushi or dim sum restaurant. Pick your fries (different cuts), pick your gravy, pick your cheese, pick your meat. There are countless combinations. We went with the classic fries, gravy, and curds, but added smoked meat and shredded mozzarella. This one just didn't compare to the others. The fries were single fried and bland, the smoked meat was flavorless, the curds were sparse and not fresh, and the gravy tasted mostly like red wine. We ate other things while we were in Montreal, but the poutine is what we'll remember most. Just got back from Montreal last weekend for my birthday, had a fabulous time! Thought I'd add some newer pics to the thread. Joe Beef. Hard to get into but if you use the DINR app you may be able to snag a same day reservation. Got an alert a few hours before and was able to snag a table @ 7:30pm. We were still processing a late lunch but didnt care! Crudites with green garlic aioli. This dish was unbelievable. Grilled lobster with a pork chop. Cod a Bras; basically brandade crusted with crispy onions.